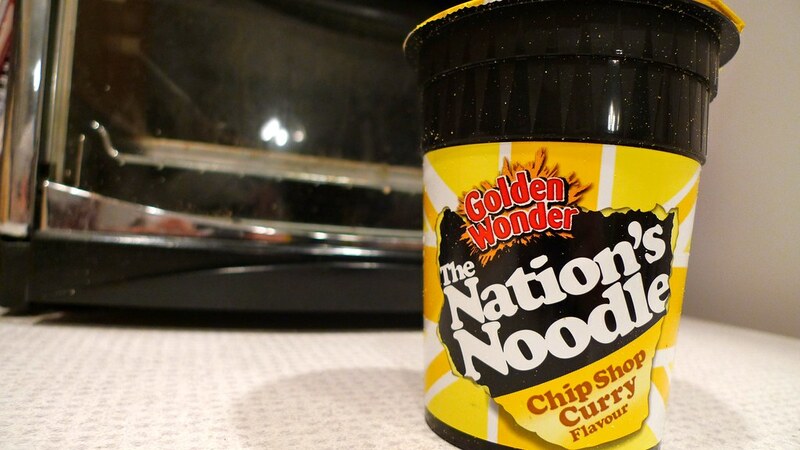 Golden Wonder The Nation's Noodle - chip shop curry. A few months ago, I asked a friend of mine who lives in England to send me a few instant noodle items from there that I wouldn't be able to buy here in the States. He sent me a box of four cup noodles (or as the Brits call them, "pot noodles") and the chip shop flavor of The Nation's Noodle was one of them. Can they make a noodle product as good as Japan, China, or the United States? Check back to read all of my reviews, but if you are interested in this one, click the 'Read more' link. A thin plastic lid covers The Nation's Noodle instead of paper like Nissin's Cup Noodles. Golden Wonder is a British company that manufactures snack foods, most notably potato chips (or crisps). Founded in 1947 by the Scottish bakery owner William Alexander, the company was named after the golden wonder potato, which is a late maincrop russet skinned variety of potato and is reputed by some to have the best flavour of all potato varieties. 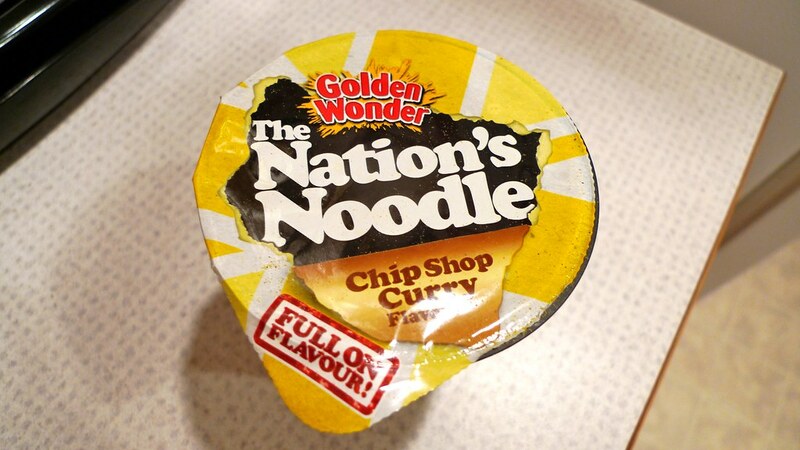 In 1977, the noodle brand Pot Noodle was developed by Golden Wonder in Japan, before being launched in the United Kingdom in 1979. Pot Noodles are manufactured in Crumlin, Caerphilly, Wales. The range of instant snacks in a pot named The Nation's Noodle and The Nation's Pasta were launched by the same company last year. They come in seven different flavors, and I would say they are separate from Pot Noodle in that the flavors come more from traditional British cuisine. 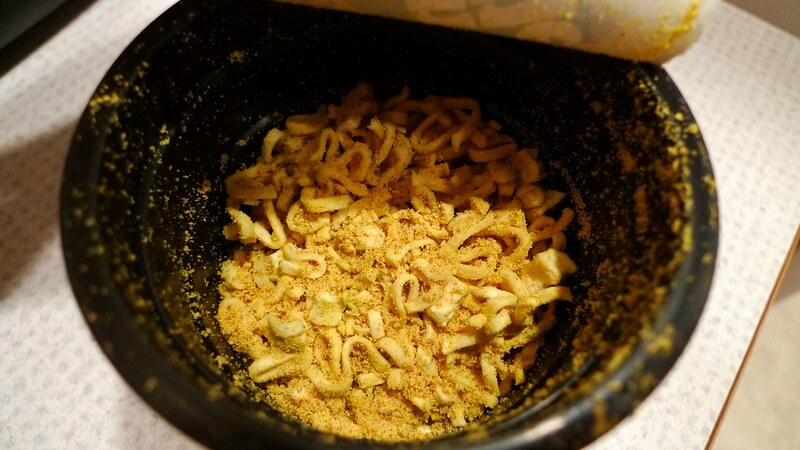 Contents of chip shop curry pot noodle. ME: What is a Chip Shop? My guess is it's short for Fish and Chip Shop, but do they normally have curry? FRIEND: Yep, chip shop is short for fish and chip shop. Most chip shops do curry sauce, which people like to dip their chips into. ME: Interesting. I was never given the options to dip my chips in curry sauce. That totally sounds good, especially since I love putting potatoes in my curry. So, I was sort of looking forward to this one. The packaging is actually simple and has nice contrasting colors. The directions are kind of comedic. 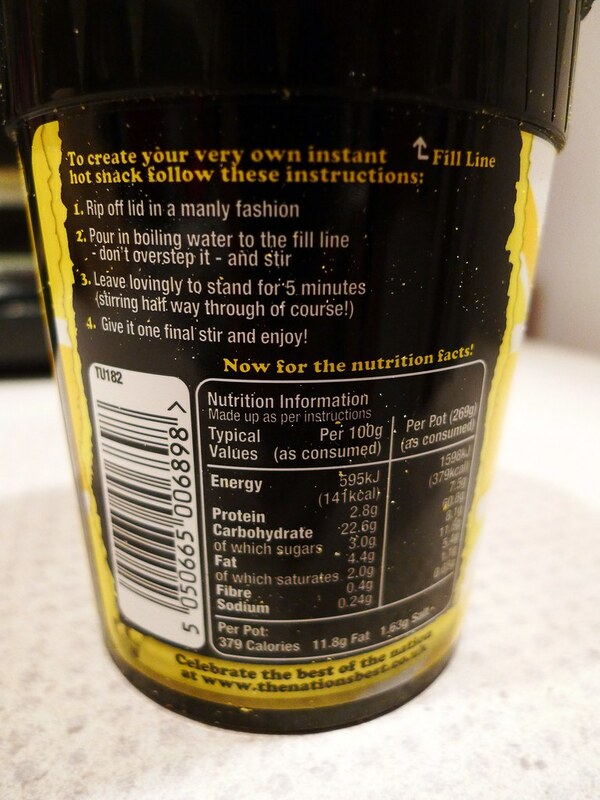 Only the Brits would make cooking instant noodles funny. This is the first cup noodle where I've been instructed to stir it right after I added the hot water. It also has the longest standing time with the lid closed: five minutes. Being used to the average three minutes, this one took a little while. I'm not sure why it needed to stand longer. You even stir it again half way through its standing time. Cooking instructions with some British humor. When I peeled off the lid when it was done cooking, there was a nice curry aroma. I saw a few chunks of something inside and wondered what it could be. Original thoughts were potatoes, olives, or fenugreek seed. What do you think by this picture? 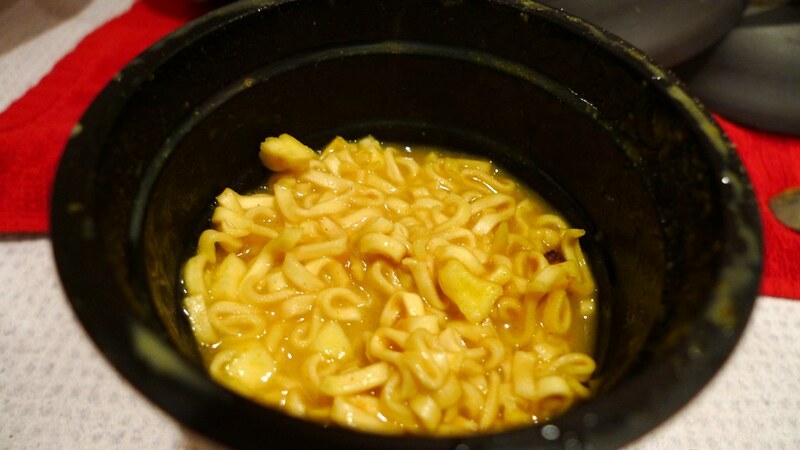 You'll never guess what chunky surprises are waiting for you in this instant noodle. If you answered fruit, then you get a cookie! 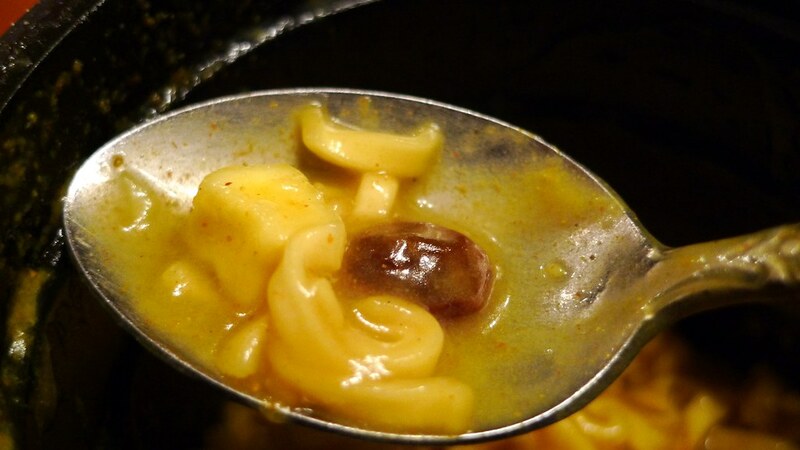 That's right, the chunks inside chip shop curry cup noodle are two kinds of fruit: apples and raisins. I am baffled by this... sort of. I've had sweet Indian curries that have had raisins in them, so that's not too surprising, but I've never had apple in my curry before. Do fish and chip shops in the U.K. normally do this? The noodles are similar to Nissin's Cup Noodle, except they might be a little bit wider. The soup itself... well, I wouldn't even call it a soup. It's pretty thick even though I added the correct amount of water. It's more like a watery sauce. The curry flavor is definitely there, but there's a sweetness to it that's undesirable. Oh, and it's not spicy at all. Juliana ate the full serving I gave her, but I don't think she really liked them. No mmm's or yummy's from her. As for me, well, I just can't get past the sweetness of the sauce and the fruit. It's silly, IMO. I feel like I'm eating oatmeal or something. I can't recommend this one at all. I'm hoping the rest aren't this bad. Apple is not something that you find in Chip Shop Curry sauce, no. Chip Shop Curry sauces in the UK are generally of the Chinese style, made with ginger and garlic as opposed to Indian spices. However, since you wrote this review, Symingtons (who make the noodles under license from Golden Wonder) have "improved" the recipe, and removed the apple and sultanas. I have yet to try them. Thanks for the info, Will!